This is a photo of a building set for demolition with a sign in the foreground that advertises the new building that's going to replace it. I thought the old building looked pretty ghostly and the way the sign is super-imposed in front of it is rather creepy. As I took the photo, a man in a suit came up to me and commented that it will be great when the new building goes up. Having just seen its twin block out the sun on the south side of the street, I wasn't too enthusiastic. He went on to say, "I don't care about the area, I mean, it's the Bowery." The glass box building on the sign has indeed been built and I have yet to see any life in it - either upstairs in the apartments or in the commercial space on the ground floor. I miss the empty lot with its grass, wild flowers and giant black and white Neck Face claw that used to adorn the north wall. 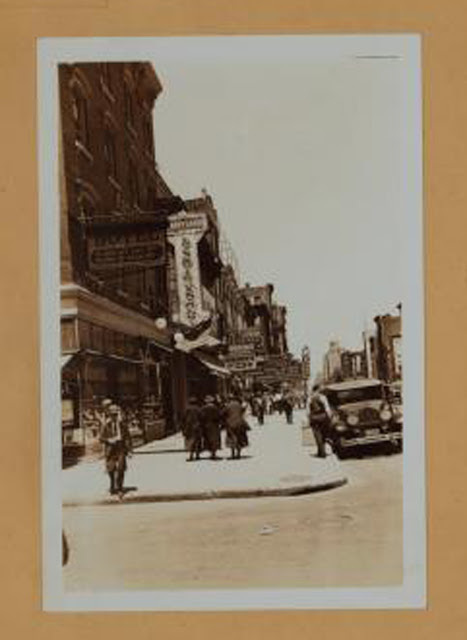 The NW corner is occupied by a hotel and, note the Woolworth Theater half a block south, next-door to what is now Mars Bar. The storage building on the east side of the Avenue is still there but, sadly, the gorgeous 2nd Avenue Baths building is now the location of the gast station. ...we can see that the hotel offers rooms by the day for $1 and by the week for $5. Last I checked, rents in the new building were starting around $2K per month. 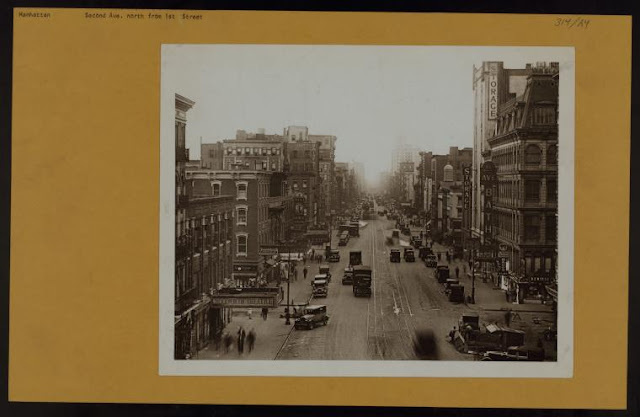 I'd like to see a "now" photo of 2nd Avenue to compare it to this great find. I used to live on the 5th floor of the building that looked down into those empty lots and abandoned buildings on 2nd Street. 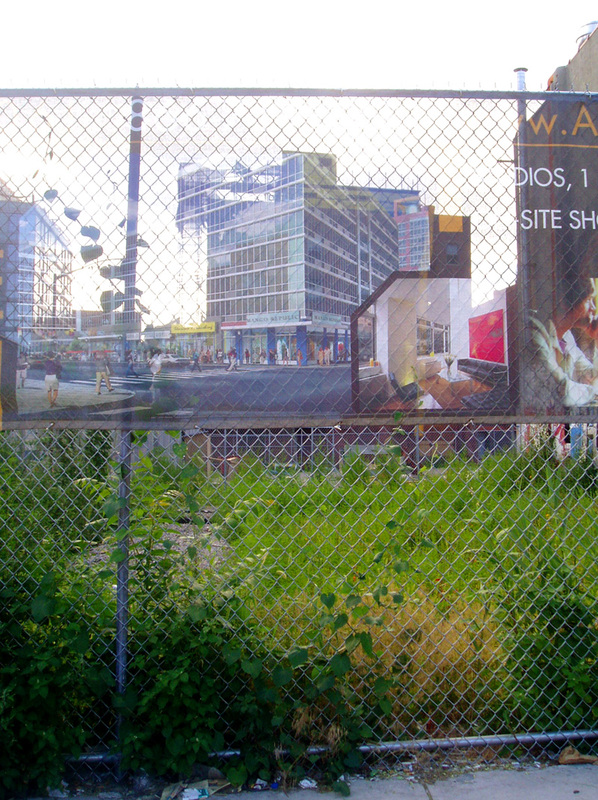 I too miss the empty lots and think the Avalon buildings aren't doing well nor do they look, well, good. @Jill - aside from Mars Bar, this intersection is so nondescript, I never took a picture of it. I am trying to work out where the 1930s photographer stood - s/he must have been on top of a building that used to be on Houston. These days, there is a traffic island of trees that prevents a clear view looking north. @Anon - I also miss Suicide Hall and the adjoining structure that was on the south side of 1st St. I always hoped something good would come of it...at least the Liz Christy Garden survived.